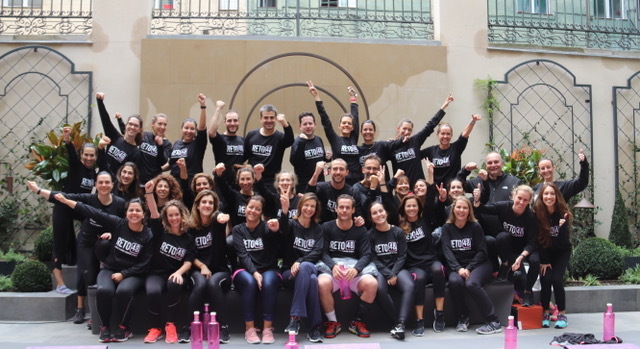 A month ago, on the occasion of the celebration of the World Day Against Breast Cancer, COOLROOMS Atocha and RETO48 joined forces and their enthusiasm to contribute to the fight against Cancer. Challenge 48 taught a Hit Yoga class, in the courtyard of our newly opened hotel COOLROOMS Atocha with the aim of donating all the benefits raised from this action to the Spanish Association Against Cancer and raise awareness among the attendees of the need to prevent and diagnose this disease on its early stage, emphasizing the importance of a healthy life, in which food and sports are essential. In COOLROOMS, Corporate Social Responsibility is part of the culture of the company from the day of our birth and we strongly believe in the philosophy of Responsible Tourism, we are aware of the challenges and accept them with the effort they entail. In our strategy we have aligned our individual Corporate Social Responsibility objectives with the SDG framework, focusing on the SDGs 8 Decent work and economic growth and 12 Responsible production and consumption, in addition to the challenges that the Tourism Sector poses: employment , environment, preservation of environments, responsible production and consumption, sustainable management of supply chains, alliance and spaces for dialogue between different actors and transparency. Among the actions we develop, we collaborate on projects such as the INCOPORA program, which contributes to improving the social and labor integration of people in vulnerable situations and we are developing a “COOLSUITE Solidaria” initiative in which the COOLSUITE 43 of COOLROOMS Atocha will donate part of the billing to a solidary cause to be selected by our own guests.